Coffee soothes my soul and warms my heart. But not just any coffee. I love coffee that is rich and full of flavor with no bitter tones. So I was very excited to sample and review Puro Coffee. I was impressed by their philosophy and dedication to the environment and organic coffee beans. I received a lovely package with three different blends of coffee including a rustic hessian bag. The package also included an adorable cup and saucer and handwritten labels were attached to each blend describing the coffee in detail. In 2005, Miko, a Belgian company which has been roasting coffee for over two centuries, created Puro Fair-trade Coffee. Miko is dedicated to reducing its carbon footprint. They installed solar panels on the roof of their Belgian distribution building and during the winter months, heat their offices by utilizing the heat generated from an air compressor to save more than 20,000 L of gasoline a year. Impressive! The Fair-trade Foundation has set the standard to help lift working conditions and improve the lives of millions of people that work in coffee-growing dependent communities in the developing world. Puro Coffee pays fair prices for all coffee beans and its organic certification helps ensure their coffee is grown in the way nature intended. No artificial fertilizers or chemical agents are ever used. The coffee is not only fair-trade, but shade grown. Shade grown coffee encourages the preservation or re-planting of native trees to provide this essential shade. This is great for biodiversity and helps keep coffee- growing in harmony with the environment. Watch a Puro Noble video to check out some of the fantastic social initiatives they are doing! Description: The complex character of this blend comes from the mild and smooth yet floral Guatemalan high grown Arabicas skillfully blended with the Peruvian Arabicas for a perfect balance of flavor. Through the addition of the premium Robusta, a hint of dark chocolate is injected into the cup, thus ensuring this blend works well in all situations. Description: Wow, good morning and a warm welcome from this intense fiery blend. This dark roasted blend of high grown Arabica’s with the finest Ugandan Robusta’s creates a warm balanced cup with lively fragrant flavors, which when added to perfectly tempered milk creates a bitter sweet chocolate. Description: This amazingly delicate blend is distinctive in flavor. It combines beautifully soft notes of chocolate with citric over tones that gives it a fruitiness whilst adding natural sweetness. All three coffee blends were wonderful. Rich and luscious. As a coffee drinker, I not only love the flavor of Puro Coffee, but am happy to support them too! If you are interested in finding out more about Puro Coffee, you can go to their website as well as follow them on Facebook and Twitter. Awhile back, I was given the opportunity to try Tropical Traditions Gold Label Virgin Coconut Oil. I immediately responded yes as I am crazy about coconut oil and had heard wonderful things about Tropical Traditions and the many wonderful products they sell. I use coconut oil daily, not only in my kitchen, but also on my children’s skin to keep it soft and healthy. This product is derived from the highest quality coconuts and the oil is unrefined. To make the oil, coconuts are used fresh (within 24 to 48 hours of harvest) from small family farms in the Philippines. Only the best coconuts are hand-picked for the company. All products from Tropical Traditions are non-GMO. The flavor of this oil is amazing. My favorite thing about this product is that it comes in glass jars (unlike plastic which can leach into the oil and cause many problems for one’s body). I used this oil in many of my recipes over the past few months, including in my Raw Lemon “Cream” Bars. Indeed it truly is the best coconut oil I have ever used! I highly recommend you try it if you get a chance-you wont be disappointed. The quality is the best around. Disclaimer: Tropical Traditions provided me with a free sample of this product to review, and I was under no obligation to review if I chose so. Nor was I under no obligation to write a positive review in return for the free product. Gluten-Free Product Reviews and iHerb Giveaway! Are you familiar with iHerb? It is an online store that sells everything from groceries to supplements. I love iHerb not only for their fabulous prices, but because they carry thousands of gluten free products. iHerb is my go to source for everything from gluten free flours to nuts and dried fruit. Thus, I was VERY excited when iHerb asked if would like to review several of their gluten-free products and host a giveaway. Of course, my answer was an astounding yes! I am pleased to announce that two lucky readers will each win a $25 shopping spree to iHerb! 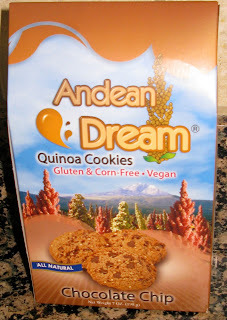 The first product I had the pleasure to sample was Andean Dreams Chocolate Chip Quinoa Cookies. These cookies are vegan which I like because I try to limit my dairy intake. 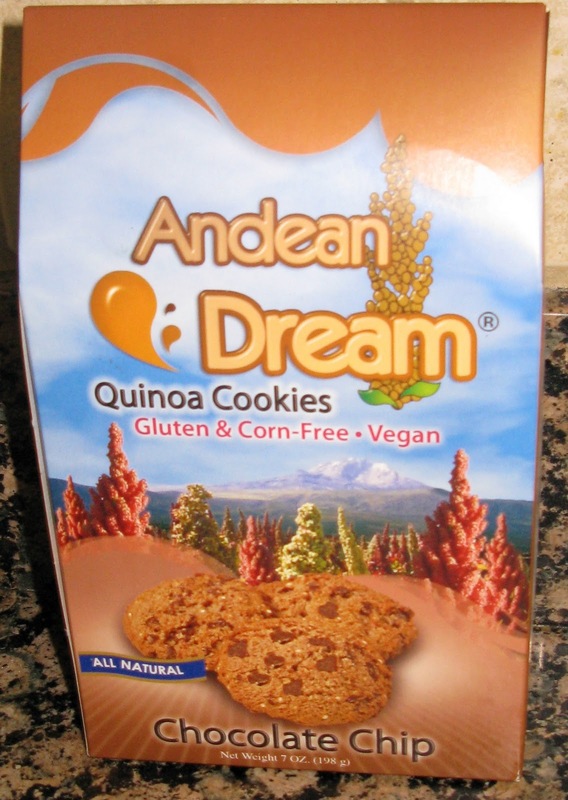 I also like that the first ingredient is quinoa flour and that the cookies are relatively low in sugar (without tasting low in sugar!) Every one in my family remarked on how delicious these cookies were and came back for a second serving. The texture of the cookies was not as soft as what I am used to, but I understand that quinoa is a heartier flour. The next product I got to enjoy was Alter Eco Rainbow Quinoa. This quinoa is a vibrant blend of three ancient quinoa grains. I like how the Rainbow Quinoa brightened up every dish I cooked it with. My husband immediately noticed how light and fluffy the quinoa was. I love that the company, Alter Eco, directly supports Bolivian farmers. The quinoa is fair trade certified and organic. I wish the price was slightly cheaper for this quinoa blend, but I have come to accept that sometimes I just have to pay slightly more for a product I believe in. I have already ordered a second bag of this quinoa per my husband’s request. Finally, I tried out Yummy Earth’s Organic Lollipops. These are indeed super YUMMY! Emma, my four year old daughter, adored them. Emma recently had a party at her Preschool and took these lollipops to share with her class. The teachers commented on how tasty they were and that the adults enjoyed them as much as the children did. It is a perfect snack for children-no mess involved! 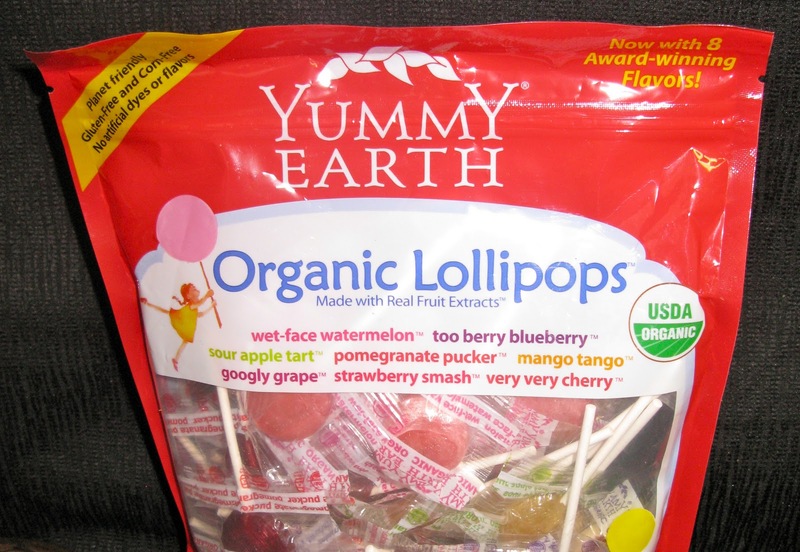 I was pleased that these lollipops are corn free (which means no corn syrup!). These tasty treats are made up of rice syrup and real fruit and vegetable extracts. I appreciate that there are several varieties of flavors-both sweet and tart. To enter the giveaway, register at iHerb and leave me a comment letting me know that you did. For a second entry, like my blog on facebook, then leave me a comment letting me know that you did (if you are already a “liker”, then leave me a message informing me). For a third entry, follow me on twitter and leave me a comment letting me know that you did (or let me know that you are already a twitter follower). This giveaway is open to everyone, and you must register at iHerb in order to be eligible to win. If you are an international winner, you will be responsible for paying any additional custom taxes and/or duties. If you live outside of the U.S., please make sure that iHerb ships to your country. To see if iHerb ships to a specific country, go to iherb.com, add a product to the shopping cart and click the “Country” drop down menu to see if your country is listed. This giveaway closes on January 16, 2012 at midnight. The winners will be selected from random.org and announced next week. Good luck! If you don’t want to wait to see if you win or are just excited to start shopping at iHerb, you can use the code GOK657 to get $5 off your first order! Disclosure: iHerb sent me these products to review; they also gave me a store credit in exchange for hosting this giveaway. All opinions shared about Alter Eco Rainbow Quinoa, Andean Dreams Chocolate Chip Cookies, Yummy Earth Organic Lollipops and iHerb are 100% my own.